Presenting part 8 of 8 of our series on Conjuration and Spirit magic for beginners. The final post in the series Today we'll talk about what is perhaps the least discussed traditional component of conjure magic: Fairies. We started the series with a list of book recommendations and then moved to information on setting up a devotional practice to develop support in the spirit world. Then we discussed scrying, followed by conjuring the elementals, we talked about intermediary and crossroads spirits. Then we discussed angels and demons. We dove into Necromancy, and now we're on our final post for this series. Other cool things will come, some of it will continue stuff we talked above over these posts, so please like us on Facebook, and share the post with your friends so that can enjoy it as well. We're wrapping up our series on conjuration by looking at fairies. Modern Ceremonial Magic has largely ignored any spiritual creatures outside of angels or demons from the post-Golden Dawn period up through now. I have often wondered why. Originally, when I was younger I assumed that most of reason for this was that fairies and dragons and nature spirits showed up primarily in folklore and pagan stories and magic and not in grimoires. Over time, exploring more and more grimoires and old books it became clear that this wasn't the reason, there is actually a lot of evidence that magic involving fairies and similar creatures was intertwined somewhat seamlessly into other magical systems of the middle ages. Richard Kieckhefer talks about this somewhat in Forbidden Rites. Work with fairies could be considered either natural or demoniac magic during the middle ages. Fairies could be viewed as spirits who work within nature under the direction of the divine plan. Fairies could also be viewed as spirits who taught humans magical powers outside of the will of god similarly to demons and devils. We see this latter feature in other sources dealing with witches. Witches were sometimes believed to have fairy familiars, either given to them by the Devil, like in the case of Isobel Gowdie, or simply spirits which approached the witch on their own. In both cases the fairy would teach the with magic. In more ceremonial sources we see fairies conjured for an array of reasons. Oberon or Oberyon is conjured as a treasure finding spirit. He also is conjured to teach the magician a wide array of things. Sibylia and her sisters provide a ring of invisibility. Fairies do a lot of the things we conjure demons for. Fairies have a reputation for causing trouble because they don't think like humans, and some have an antagonistic view of humans. But fairies are still more like humans than demons are. Fairies are also part of the elemental world in which humans reside, even if they're part of a separate phase of it. With these elements in mind fairies are likely a very useful group of spirits to approach for many practical everyday sorts of purposes. Personally I've never been much for fairy magic. Growing up with fairy stories and traditional magic the NeoPagan approaches to fairies did not seem safe or sensible. The idea of treating fairies like gods or guides neither fit with what we saw of fairies in folk tales, nor what happened with them in mythology, and it certainly didn't address the fact that pagan folk traditions and their Christian counterparts seemed focused on keeping fairies away because they were dangerous. So my fairy experience growing up is somewhat limited. 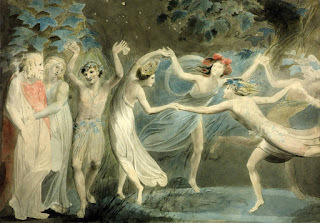 I'm still putting together thoughts on fairies for ceremonial magic, and so this post today is largely focused on ideas and sources and thoughts to consider. We're wrapping up our exploration of conjure magic with thoughts, and hopefully inspiration towards moving further to add an additional element to conjure magic rather than instructions for something else we've all done before. I had started looking at the Book of Oberon because my curiosity about conjuring fairies had increased. For about a year or two at that point I had been wondering about work with fairies in a ceremonial context. Reading some Isobel Gowdie transcripts made me more curious about it. I started looking more earnestly instead of considering it just a future project. But as you can see I didn't really like what I found in the Book of Oberon. The conjuration takes about five pages. It reads like a more cumbersome version of what we find to conjure demons. A lot of asking the spirit to show up and not be frightening and to not delay, and to show up in the appearance of a pleasant looking child, and it references, but without using them, holy names, and then it escalates as such things do and begins to reference angels and saints and names of god and curses and commands. To me the names don't make sense because Oberon as a king of fairies would be a power to call upon to command other fairies. He exists in a whole other world of gods and spirits outside of Christianity and Judaism. I very much feel comfortable working within a Christian context, and believing in the powers of that context, when it is appropriate to what I'm doing. But it doesn't mean I don't believe in anything else. I believe in the gods and spirits who are subordinate to them as well. If I wanted to call upon Athena, I'd probably just call out to Athena directly, but if I needed some higher authority it would be Zeus not HaShem. Aside from that the conjuration is just too long and not smoothly put together. It's just not aesthetically pleasing. So, aside from the Folger Manuscript/Book of Oberon, where can we look for ways to conjure the fair folk? There are a lot of sources, and I'll be doing posts based on information we can get from various places in the future. There is way too much to do all in one post here. Reginald Scot's collection of materials has information which is useful, including a couple methods for contacting fairies. Doctor Rudd's material doesn't, as I recall, give much in the way of instruction but it gives several types of fairy and fairy like spirits and information about them. We noted the Folger Manuscript as a resource in terms of it's long conjuration, it also holds several seals and the names of several fairies, and presents some under the rulership of Oberyon and some under Mycob. The Book of St. Cyprian has been suggested by Jake Stratton-Kent as a possible source, as has On Magical Ceremonies by Agrippa. The Grimoire of Arthur Gauntlet and the Book of Treasure spirits contain some material as well, but they both are drawing from Folger. There are a ton of sources which we would call “ceremonial magic” or grimoire magic books that include work with the fairies. Some magicians would incorporate aerial spirits, and the elementals as described by Paracelsus as examples of fairies, which would expand the ceremonial sources and methods we have available to us. I'm not sure I would consider these as fairies necessarily. There are also non-ceremonial magic sources we can use. Robert Kirk's Secret Commonwealth is a valuable resource for exploring work with fairies in a folklorist context but from a practical perspective based on someone who encountered the fair folk prior to NeoPagan views on the subject. The Fairy Faith in Celtic Countries is another resource for folklore related to the fairies. Exploring folklore more directly by looking at fairy tales and folk customs can provide insight as well. The mythological and religious systems of the Greeks and Romans, the Celts, and the Norse and Germanic peoples will all provide further insight into who rules fairies, what things they want, and how they can be approached in traditional systems. What we lose in exploring these sources is the practical magical component. But we get a feel for how to approach, which is what is missing in a lot of the more magical texts. Combining the info we can take from each type of source can help us put together a full picture. Identifying what types of spirits we think of as fairies would also help. I think a starting point is to consider spirits that aren't gods, or angels or demons. That gives us a pretty wide range. From there we can look at descriptions of fairies in various folklore. We can look in magical texts at how fairies overlap with other spirits. As we begin to come up with a series of features, behaviors, responsibilities, we can start to catalogue and build structures for understanding these spirits and how to work with them. If you feel curious about working with fairies in a context more like standard conjure magic but with an eye towards a conjure system appropriate to these spirits, I'd love to hear about your work. There seems to be a sudden growing interest in this. In addition to my post and the ensuing discussion about it back in October, about two months later there was a pretty thorough discussion with more people involved in the Solomonic group on FB, and in another group Dr. Al Cummins started posting some blogs on the subject beginning around Noveber 5th. Before we leave off, and again we'll be returning to this subject a fair amount, these are my thoughts on a direction towards a method. 1. Just like we discussed work with an intermediary, there are spirits who serve this function in the various cultures we might explore for fairy work. If we're looking at elves or dwarves or wights we might look at Heimdal, if we're going with Irish or other Celtic fairies we might look at Manannan or another nation's variant of him. So we might call upon the gate keeper who the fairies would fall under and ask him to open the way for the fairies to get to us. 2. The fairies often live near the dead. So, the work we have suggested with ancestors and the necromantic work may come into play for seeking the aid of the dead, or those who might rule the lands adjacent to fairy. Reginald Scot specifically suggests using the dead to go find the fairies one desires and bring them forth. 3. Some prayer of conjuration should be used. We see this in the ceremonial examples. But those conjurations work with the authority of God names foreign to the fairy. So we can identify gods to whom the fairy might respond. For Irish Fairies the Dagda has been associated with the places where the fairies reside, for Norse and Germanic Fairies Weyland may be an option or Othin, for British Fairies Oberon could be an option, for Nyads and Dryads and other spirits from Greece Zeus, or Pan, or gods and heroes with whom those spirits had a relationship. While not all fairies are nature spirits, they do often seem to have a connection to either nature of the underworld, and so the authority of the land itself could also be used as a means for calling them, as the land itself and the natural features of the land would be filled with gods and spirits and would in some cases form boundaries and sources related to the power of the fairy. 4. Some gift or offering should be made. In the Colloquy of the Sages the fairies are often drawn out by giving apple branches. So for Irish fairies apples seem an obvious gift. Certain mythological features would make apples sensible for British fairies as well. Milk and butter, bread, those are also common gifts, and so likewise looking at fairy stories, mythology, and folk customs would provide information on gifts. 5. Water and glass/mirrors may make sense as scrying devices, or candle flame. Crystals are of course the standard for spirits and so could be used as a scrying device as well. So again, we'll come back to this subject over time. I'd love to see what others are doing with it as well.